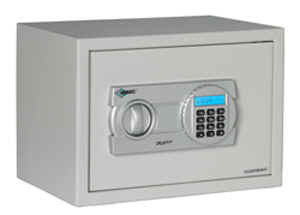 Fire-Rated Safe. Excellent for protecting important home documents. Electronic Keypad Lock: AMSEC DL4000 lock. Up to 1.000.000 unique combinations, easily changes to a new number. Includes 1 emergency key-lock with (2) keys. Bright blue LCD display with a low-battery indicator and a power override battery box. Interior sliding tray for loose items. Carpeted base. Mounting feed and anchor hardware standard. Can be bolted to the wall or floor. Clear Door 7 ¾" x 97/8"